The following information about Jabhat al-Nusra’s offensive against the Syrian Revolutionaries’ Front and Hazm Movement in the Jabal al-Zawiya region comes from a well informed source who has been in the area over the last several weeks. The following information about Nusra’s ambitions and movements was relayed by him. 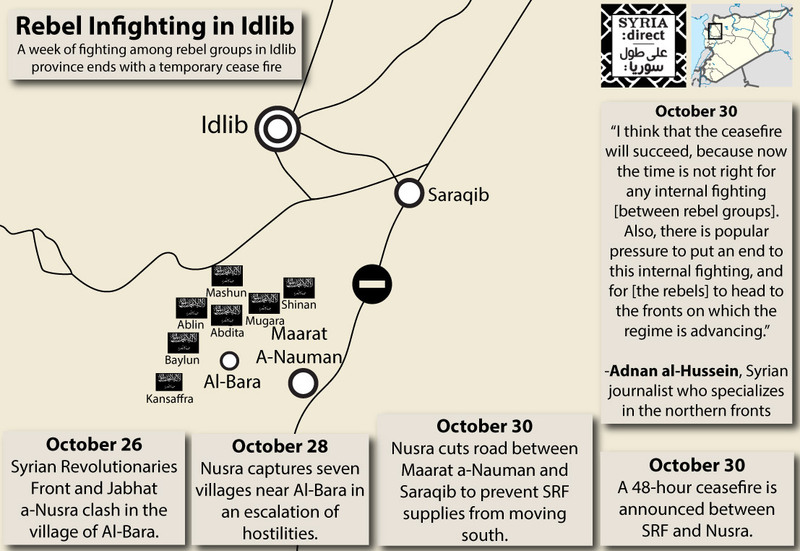 Jabhat al Nusra (JN) continues to advance in the villages of Jabal Al-Zawiya, including AL-Bara , Kansafra, Ehsim, Der Sunbul (Jamal Maaruf’s home town). Blin, Bluin, Bsqala, Binnish, and Saraqib are under the control of Jund Al-Aqsa, a group loyal to Ayman Al-Zwahiri. JN has advanced west of the main Damascus-Aleppo highway to Kafr Ruma and east of the highway to Tal Manis, Maarat Shurin along with Filaq AL-Sham brigade. Nusra also controls Ma`saran village where they are led by, Hamido, a 42 year old local who was a FSA fighter until 10 days ago, when he joined Jabhat al Nusra and became its PR director and local negotiator. 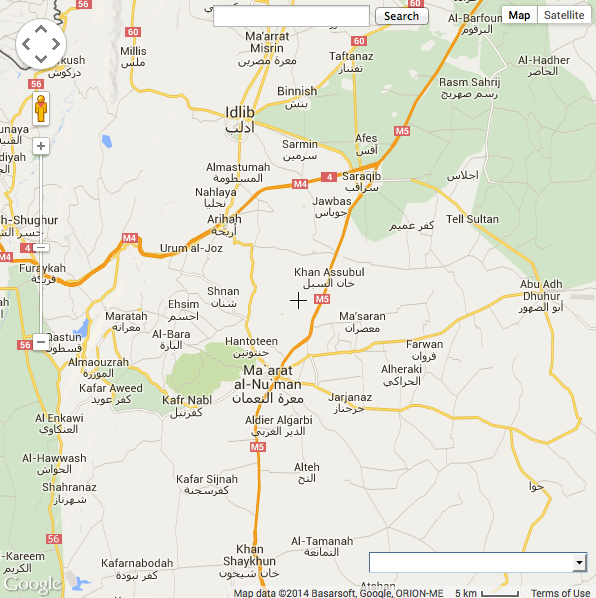 JN also captured the villages of al-Tamanah east of the Khan Shakhun area. JN is in alliance with the Islamic Front and with Suqur al-Sham, a large militia that has been part of the Islamic Front in the past. JN has made a deal with Al-Khansa Liwaa which is led by Ahmad Al-Shaikh, the head of Suqur Al-Sham. He is the head of the Shura council of the Islamic Front. JN has also struck a deal with the Liwa Safwa group from Suqur Al-Sham. JN also has an alliance with the Ahrar Al-Sham groups : Liwa Al-Abbas based in Bliun and Abu Saleh Al-Tahhan, one of the main military leaders in Ahrar Al-Sham. He helped JN its recent campaign against the Syrian Revolutionaries’ Front and Hazm Movement. 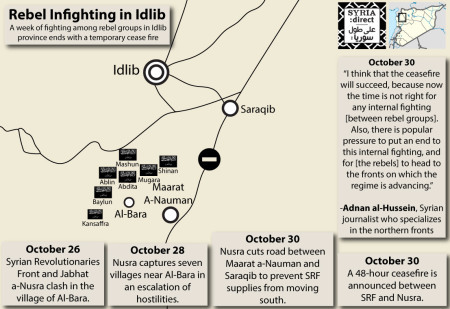 Why is the Islamic Front keen to deal with JN in Idlib? According to some people on the ground, Ahmad Shaikh, the head of Suqur Al-Sham, is ambitious to become the dominant leader in the area. Jamal Maaruf was his main competitor causing him to team up with Nusra in order to drive out Maaruf. Nusra leaders also accused Jamal Maaruf of being a thug, who was not only corrupt, but who regularly tortured those who opposed him. Nusra announced that it took all the ammunition and weapons that belonged to the SRF. But in reality they just took 1 tank from Hazem, BMB and ammunition. A few soldiers from each of these battalions participated in the force but not all of them were serious about their mission. Nusra agreed to their operation, but they were not able to stop Nusra from advancing to other villages. In regards the mediation effort led by Ayman Haroush and Hassan Dughem and others. They started meetings in the area and consultations between the groups to stop the war between Nusra and the SRF but on the 26 of October. Jund Al-Aqsa arrested Shaikh Muhamd Ezz al-Din Al-Khatab and other 2 judges who accompanied him at the time, and till now, no body know where the Shaikh and others are. Jund Al-Aqsa has refused to release them. Most of the people who were trying to negotiate with Nusra are now in Turkey. They lost hope in arriving at any understanding. They insist that Nusra was not serious about negotiations. What is more, Nusra is difficult to reach its leaders refuse to use the internet. According to Nusra’s leader, Joulani, he explained in his recent speech, “We want to finish Jamal Marouf and the SRF since they are dealing with Saudi Arabia and the USA” Joulani said that they’re not alone in this war, meaning that Suqur al-Sham and Ahrar Al-Sham are equally interested in doing away with Maaruf. Joulani insisted that all other battalions would work with the Nusra. He stated that the US supports Maaruf and the FSA to fight Nusra but not Assad. Nusra is not interested to cooperate with IS in in Idlib province because Nusra hopes to build its own Emirate in Idblib province. Last month they only controlled Salqiin and Harem, but now they control most of the Jabal Al-Zawiya. Now Jamal Marouf is in Turkey. He has long meetings yesterday with FSA leaders in Rehanli. Saddam Al-Khalifa who was a Motorcycle dealer from Hama before the war, is presently the leader of Uqab Al-Islam, a Salafi Jihadi militia, which close to ISIS, but not under its direct command. 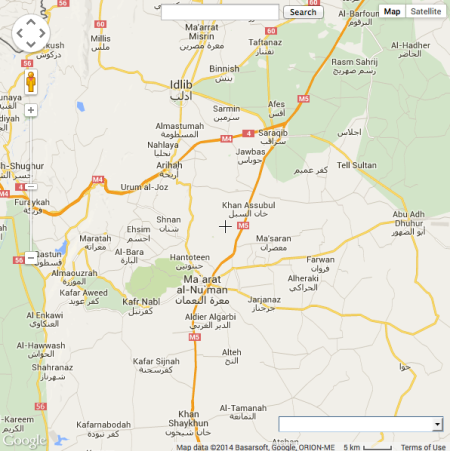 Al-Khalifa controls the area east of Idlib and Hama. It is largely populated by bedouin who belong to the Al-Mawali tribe among other. Saddam has very good relations with the people there and they trust him. There were Rumors that he would support Nusra but so far the region has stayed out of Nusra’s control. The Syrian Organization of Human Rights (SOHR) reports that trusted sources claim that “clashes renewed this morning between the fighting battalions around Der Sunbul village, which is the main stronghold of the Syrian Revolutionaries Front and around Hantonen near M’rah al-Nu’man. SOHR also reports that Jund al Aqsa, the group helping Nusra, still hasn’t found the body of its Qatari leader, Abo Abdul Aziz al- Qatari. He was kidnapped in January when fighting first broke out between ISIS and the rebels. The Qatari commander was allegedly killed by the SRF. It is believed that his body was thrown in a local well. Prior to these events, his son was killed by the SAA. Al-Nusra Front published videos that show men retrieving bodies from wells in Deir Sunbul, the hometown of its commander “Jamal Ma’ruf”. Al-Nusra Front, however, claimed that these bodies were those of civilians and fighters executed by the SRF. None were the Qatari leader of Jund al-Aqsa. Well, the US bombed Nusra and Ahrar al-sham today. Warmonger in chief, senator John McCain wants troops in Syria, arms for Ukraine, an examination of “China’s continued encroachment in the south China Sea”, and an investigation into warming relations with Iran. McCain is set to take over as head of the Senate Armed Services Committee. Expect the other party of war, the Democrats, to cooperate. On Wednesday, Obama Asked Congress to Authorize Islamic State War. Shouldn’t you be saving the Ruble, which seems to be following the Iranian Currency in its descent… instead of going after US elected officials. Yes, it is true, falling the ruble mean certainly falling revenues associated with all of Western contracts! Nusra slaughtered more than 2 dozen local Druz volunteers in jabal al- Shaikh who were defending their villages against nusra terrorists (who are receiving cover from Israel). SOHR and other opposition sources conveniently ignored the fact that the confrontation did not involve the Syrian army, Israel now sees an opportunity to bring in Israeli Druz to help their ” brothers” in Syria, the desired outcome is establishing a new reality on the ground where only pro Israel forces are allowed to operate near Israel’s borders, that explains why nusra and rebels there did not fire a single bullet at Israel, the IDF made it clear that their only enemy in the area is hizbullah. What you said is true for economies that either manufacture desirable products and need to maintain economic growth, or for states whose currency is a major international currency of commerce. Putin’s Russia is neither. For resource extraction economies such as Russia, it means more resources given away for less hard cash and less development. By your standards, Mozambique would be the most successful economy in the world, followed by Iran. I look forward to see the great wondrous accomplishments of the alliance of the economically challenged. Many have tried bartering alliances as replacement for IMF and WB and other international monetary arrangements, remember, these attempts led to the fall of the soviet union. Syrian Hamster you seem to be as relevant as an economical “analyst” as you are as a military, theological, sociological and political “analyst”. General knowledge seems not to be one of the strong sides for you Takfiris. EU’s main trade (export+import) partners in 2013 were 1) USA 484 billion €, 2) China 428 billion and surprise number 3 is Russia with 326 billion. In import to EU Russia is number 2, after China. For my country Finland, these sanction and anti-Russian policies have been expensive. Russia has been our biggest trade partner, measured in Euros not in land area. The Finnish import to Russia fell in August 2014 with 22 percent compared to the equal month in 2013. Surprisingly to Finnish politicians the Russian imports value fell only with 13 percent and most of that fall was caused by the falling world market energy prices, not in volumes of imported goods. Our trade deficit with Russia is now even worse. It happened not so as the USA’s and EU’s leading Russofobs promised to us Europeans. For Europe the reality is that it has spoiled the relations with a 150 million persons market just in the neighbourhood, lost the future access to desperately needed raw material sources etc. The reality is that EU needed Russia in many ways more than Russia needed EU. Surely this mess has and will hurt Russia, but it hurts more EU which needs also in future huge amounts of oil, gas, metals, timber etc. Replacing Russian energy import will not be easy or cheap. Neither will it be easy finding the new customers to the 120 billion euros goods which EU used to export to Russia. What is far more relevant than me is WTO. Much of the problems with European trade are less about your imperialist arch-enemy the US and much more about WTO commitments, yet to be honored by Putin’s. This is what continue to threatens a really solid trade framework agreement. So, to ensure my irrelevance, i would argue that trade is not merely money numbers, imports or exports. For Europe, standards and practices are as important as numbers. Until Putin’s Russia start fulfilling its WTO commitments, you can bank your emotional analysis probably in Iranian and Cuban banks. Second, who said anything about China. Funny for Russia to boast of research progress in China, which has been phenomenal. Yes, Greece is a member of Nato, but I am yet to find a Greek boasting the “incredible research” in the US, UK, or Germany. You as always talking with the power of knowledge! fellow. Well Hamster China and Russia are today “united” in many forms politically, militarily and financially. And the more hostile USA acts against Russia and China the closer their links will become. The recent gas deals and massive investment plans are a sign of that future. China needs the Russian raw materials and markets, that is a fact. Even an extreme USA admiring Takfiri should be able to understand that. If USA and EU believe that they can control and use WTO as their “own” tool it only makes WTO fast irrelevant. Too much of world’s trade, technology and capital is nowadays in hands USA and its lapdog EU can not control. Also creating trade rules and policies which benefit USA and “rich” countries at the expense of more poor is hardy a political and popularity asset for USA. Before the USA’s world was “simple”. USA and western Europe were main players of world’s trade, finance and technology creating and basically the only large option for others. That is not any more the reality. Every day the world’s non-dollar trade volumes become bigger and so diminishing USA’s political influence and possibilities. The day will come when US mariners have to row their war ships back home when nobody doesn’t give any more credit for buying fuel.